Face Lift Dentistry® is the leading edge non-invasive bite correction method used to correct misaligned bites, reverse the effects of aging and optimize the jawline and facial profile without the need of surgery, braces, appliances, or drilling down healthy teeth. With VENLAY® Bite Restoration and JawTrac® this method creates the ideal shape to the patient's face with physical benefits and stunning cosmetic results. VENLAY® Bite Restorations are individual super strong handmade porcelain restorations that become part of your teeth when bonded so you eat, brush, floss and speak normally. 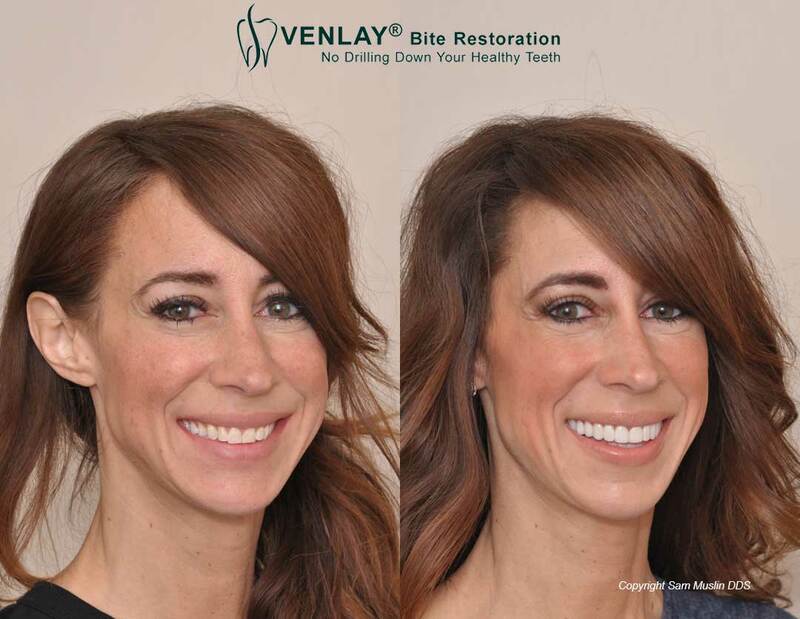 The VENLAY® restorations are the innovative "no tooth grinding" tooth and bite restorations that are the alternative to invasive porcelain crowns, veneers and jaw surgery. The optimized position of your jaw can improve the quality of your life. Most of us have a compromised jaw position that decreases our sleeping ability, makes us look older and compromises the shapes of our faces. JawTrac® can three-dimensionally locate your ideal jaw position for anti-aging benefits, chin size and bite correction improvements that physically position your jaw without force, pain, drugs or surgery. Patients can have their lives transformed with the ideal shape to their faces, jawlines and reduce the stress and tension to the head and neck areas. Dr. Muslin recommends that every patient suffering from underbites, TMJ problems, premature aging, poor facial profiles, and overbite conditions choose non-invasive VENLAY® Restorations. There is far less pain, no drugs, no recovery, no drilling down your healthy teeth and stunning cosmetic benefits. Dr. Muslin and his experienced team perform the Face Lift Dentistry® method to restore bad bites in about a month and it only takes 2 visits for those patients flying in from other states or countries. This treatment can optimize your “first impression”, help you look years younger and can boost your “first impressions”. The Face Lift Dentistry® method utilizes JawTrac® Jaw Alignment for the optimum jaw position and VENLAY® Bite Restoration to correct the bite. This treatment is exclusively available from Dr. Sam Muslin at his dental office in Santa Monica, CA. The Face Lift Dentistry® Method corrects bites without years of braces or jaw surgery and without drilling away your healthy teeth in just a few weeks. Patients can improve their health and get stunning cosmetic results. VENLAY® Bite Restoration can correct an underbite without jaw surgery and without pain, quickly, safely and predictably. This is the future of bite correction and a life transformation. Many patients have chins that look small because of the bad jaw position and a deep overbite. Once the overbite is corrected the chin will appear larger because the jaw position was optimal for the first time in the patient’s life. The shapes of our faces are not ideal because most of us do not have the best bite position and jaw position for our facial structure. JawTrac® finds and establishes your optimal jaw position to create a better profile and reverses the effects of aging. JawTrac® is designed to improve the health of the patient by idealizing the jaw alignment. VENLAY® Bite Restoration builds the bite that makes harmonizes with you newly aligned jaw. Many patients with TMJ problems, bad bites, underbites and overbites experience fewer headaches, less jaw pain, less tension and stress with the Face Lift Dentistry® method. Non-Invasive bite correction is one of the most significant breakthrough methods in dentistry today.